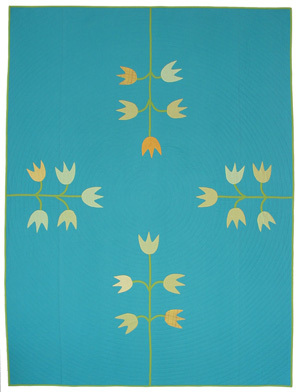 Denyse’s fantasy tulip trees grow toward the center from each side of this quilt. The concentric circle quilting radiates out from the center. Subtle fabric variations enliven the blooms that sprout from the branches of the tulip trees. It is impeccably hand appliquéd and hand quilted by Amish woman in Minnesota. Ask us about color variations of this design.